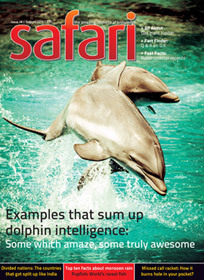 The November 2014 issue of Safari – a knowledge and science oriented magazine from India – is out quite on time. Here are our personal views and reviews about the same. The inside cover page shows a mega-pixel image of another wild-life creature. The FYI segment have four articles, one page each. The first article talks about the shape, size and fate of the universe. It makes you think that probably the Universe is not a sphere. You will like to read it, if study of Universe is what you love. The article about the Toy train of Darjeeling is informative. It is written in a news-article like manner which contains some interesting information about the train and its route. The basic information about INS Kolkata and INS Kamorta, two new warships added to Indian Navy’s fleet; is explored in a small yet informative article. The images of both the war-ships is one more positive aspect of the article. An article about chocolate gives interesting information about chocolates. Of course majority of us like chocolate which makes the article good to go for. The statistical information about how many beans are needed to create a 500 gm. chocolate will be found interesting by a lot of readers. I am a big fan of the theory of “Murphy’s law”! It says “if anything can go wrong, it will!”, and we had seen it practically proving true in most of the cases. For example if you have a bread on which you were adding cheese and it accidentally fall from your end; the surface with cheese will touch the ground, to make it worst. (This is the very first example we read before years, about Murphy’s law”. An article by B. M. Purohit about Murphy’s law is interestingly written in detailed manner. The illustrations are fantastic and the incidents listed (which makes you feel that everything goes wrong with you) are really interesting. The article is embedded with a photo of Edward Murphy (the father of Murphy’s law), and we like the gesture. An article about something considered as hypothetical in a knowledge magazine, and that too written in analytical manner – is a rare combination of attributes.Don’t miss reading it. 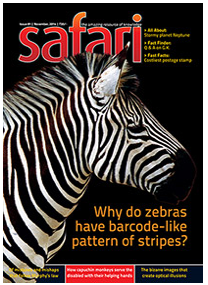 D. N. Kaushik’s article about Zebra’s stripes is mainly for nature and animal lovers. Usually we don’t consider the stripe on an animal’s body, worth talking much about. We often feel, there may not be much special. But if we ask a question to ourselves that, almost everything happened to any organ of any creature over the period of time, has something to do with it’s quest to survive; what role the stripes makes in this aspect, to zebra’s survival? Then, you will find it interesting to search for the answers for the same. Ravindra Acharya’s article about optical illusions is 7 page long and will interest everyone from kids to youth to mature readers. Rather than talking much about it, we will simply say, just go for it, you will enjoy it. The – fast facts – segment talks about the postage stamps. If philately is your hobby, you should not miss it. When we talk about the animal as friends, we often think about dogs. Then we think about horse, parrot, cat, elephant etc. But, what about monkeys? Do you know the capuchin monkeys serve the disabled in really admirable ways? An article by Smarth Vyas explores it nicely. After reading the article you will tend to think that it is almost the same (or sometimes better) service a disabled person can get from capuchin monkeys, as he/she could have got from a human. The world is a place where anything can happen. Do you believe that there is a mansion built for “the departed”? There is a home with around 160 rooms (we should call it a palace right? 🙂 ) in San Jose, CA, USA; which falls in this “believe it or not” category. Why, when and why decided to build it? How many years the work was going on? What is there in this home? Who and how takes care of this home? Read the article and you will get the answers. If you want to read about something amusing to pass time and improve knowledge; you can go for this article. How is it that many biscuit companies sell their biscuits under the same tag of “Marie”? How powerful is a human eye compared to the most powerful digital camera? How many currency notes are printed annually by Reserver Bank of India? What is the cost of advertising on outdoor hoardings and billboards? Mobile jammers are often deployed in the cavalcade of VIP or at other high security venues to disable the mobile phones in the area. how does the mobile jammers work? Which planet of our Solar system has the most moons? Why are the wing tips of modern jet planes bent upwards? What is the scientific reason and what purpose does it serve? Which are the longest and shortest national songs of the world? How much quantity of water can an elephant hold in its trunk? Which country has the shortest coastline? A bird called “road runner” is often seen in the popular cartoon show. Is there such a bird in reality? Do all the stars that we can see today, actually exist in distant universe? What is the origin of the flavouring agent “khus-khus”? It is derived from which plant? The article exploring – All About – Naptune is interestingly written and will appeal to those who love to know about planets. The editorial is an important part of any publication, it not only convey the editor’s vision about the publication and its various aspects and segments; but it also serves as the bridge between the editor and the reader. This magazine doesn’t have an editorial, as a downside. It is worth to note that there are a very few magazines we came across which offers a quality reading material. Safari – a science and knowledge magazine is one of them. You can surely go for this issue, it is worth the money and time spent to read it.